It’s almost as if the La Plagne plateau was created for skiing. Positioned in the centre of a huge bowl, the resort and ski area are contained to the east, south and west by towering mountains which help to preserve the snow and act as a perfect suntrap. What more could a skier ask for? Glancing at a La Plagne ski map, one may notice the liberal use of blue lines – skiing La Plagne is a dream for the cruisy blue devotee or a family or beginner ski holiday as the gentle slopes are perfect for gaining confidence or bombing around with the kids. However, any advanced skier worth their onions should be aware that the resort also boasts some seriously undervalued off-piste terrain. Plus, making up half of the Paradiski area, one of the world’s largest ski areas, means the resort can offer enough kilometres to keep even the most piste-hungry skier satisfied. La Plagne accommodation is spread across a total of 10 villages, with traditional mountain hamlets lower down and purpose built ski stations higher up to a respectable altitude of 2100m. The original Plagne Centre is one of France’s first ever built-for-skiing villages and what the buildings lack in charm they more than make up for in convenience. La Plagne chalets and resort buildings are interconnected by tunnels and walkways – extremely practical in the cold and snow. A free bus service or late night pedestrian chairlifts ferry visitors between the resorts and although nightlife is on the quieter side in keeping with the family atmosphere, those looking for a party will find sufficient choices. There won’t be time to be blue on a La Plagne ski holiday! Extensive Ski Area – La Plagne has more than enough skiing to keep most people occupied for a week on its own, let alone when you factor in the rest of the Paradiski area, including Les Arcs, which offers a total 425km of marked pistes. Plenty of Choice of Accommodation – With 10 different villages to choose from, and a range of chalets, apartments and hotels to suit all budgets, La Plagne has something for everyone. Family Friendly Feel – La Plagne’s easy-going air, accessible villages and great swathes of cruisy intermediate skiing make it a great choice for a family ski trip. 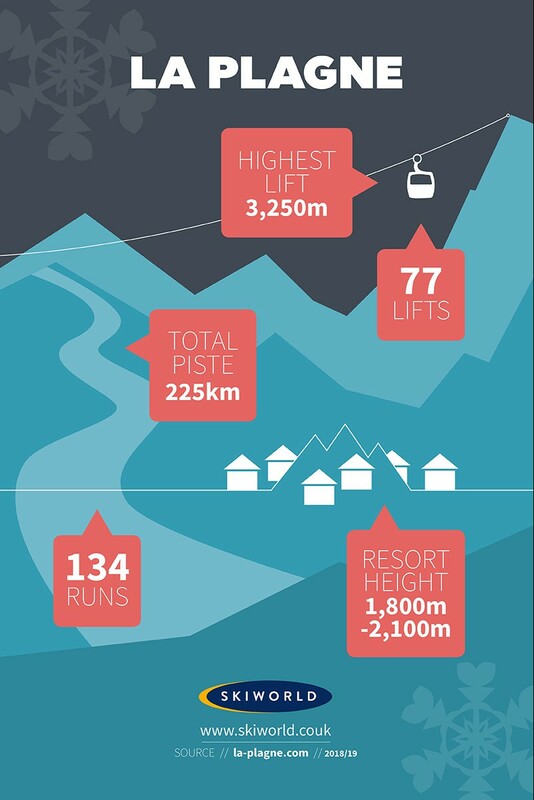 86% of La Plagne’s pistes are blue and red providing a lot of scope for beginners and intermediate skiers. All the villages have beautiful nursery slopes and the vast blue network means you can quickly develop a taste for exploring the mountains – especially good are the runs under the Arpette chair. Intermediates can eat up the kilometres and there is also enough challenging terrain to keep stronger skiers entertained, plus the link with Les Arcs. The Carina run under the Colorado chair is great for testing your speed or test your knees on bumpy red, Vega. Don’t forget to take a trip through the Grand Canyons, a natural halfpipe, or drop down to Champagny for a taste of off-piste skiing. For challenging reds, head for La Grande Rochette and the other runs off the back of Les Verdons. When skiing La Plagne it’s also not always necessary to aim high – some of the most charming and picturesque pistes are the lower and more underused runs down to Montchavin and Montalbert, which offer good skiing for all amongst the trees, especially in flat light or high winds. Advanced skiers should not be fooled by the resort’s nicey nicey piste map; skiing La Plagne offers challenging blacks plus some excellent off-piste, which has the added bonus of not getting tracked out too quickly. Don’t miss the big cliffs and steep powder fields under the Inversons chair featured in many an extreme ski video, but what experts really come here for is the Bellecote glacier – choose from either a lovely blue piste back down or three of the most famous off-piste descents in the Alps, including the legendary North Face (all off-piste skiing should only be attempted with a knowledgeable mountain guide). Of course, you could also enjoy the (count them)four freestyle parks, three boardercrosses, half pipe or mogul stadium if you’ve had enough of the pistes. Lift Passes in La Plagne Les Arcs and La Plagne both sell 3 types of lift pass. As the areas are connected you can either buy a local area lift pass for each or a full area pass throughout your stay where you can venture between areas as often as you would like. The local area pass is ideal for beginners as each area covers a huge range of terrain and they each provide ample area to explore. Most intermediate and skiers will be content with a local area pass as each area contains more than enough runs to keep even advanced skiers happy for a week. For those who want complete freedom over the area the Full area pass is perfect, you can cover as many pistes as possible and go from each area as often as you would like. La Plagne chalets are cosy and warm which is why most La Plagne ski holiday-makers tend to opt for a night in front of the fire, especially if on a family ski holiday. Don’t get too comfy though as no trip to La Plagne ski resort would be complete without a hurtle down the 1992 Olympic Bobsleigh run. You can choose to go on your own or in a team for the adrenaline rush of up to 3Gs, around 19 bends at speeds of up to 108km/hr. Or if you fancy going up instead of down, the village of Champagny boasts the largest ice-climbing tower in the world. Quieter thrills can be had at the cinemas in Montchavin, Plagne Bellecote, Plagne Centre and Aime La Plagne, or sink some pins at the bowling alley in Belle Plagne. For those who do want to venture out, there aren’t hundreds of bars but they do make a lot of effort. You’ll find the most choice up in Belle Plagne. La Tete Inn is great with old milk churns for seats and a lively atmosphere or spice things up at the Cayenne, the resort’s very own Tex-Mex bar and restaurant. Saloon is the place to go if you want to dance until 4am. In Plagne Bellecote the top choices are Cosy Bar and the Showtime Cafe. Make sure to sample the homemade rum at No ’Bleme or have a howl at Luna if you’re on a La Plagne Centre ski holiday. Skiing La Plagne is a real treat for anyone who enjoys their mountain restaurants. The high altitude of the villages that make up the resort, plus the fact that most of them are ski in/ski out, lends itself perfectly to on-mountain dining without the on-mountain price tag. And there are a fair few excellent choices to get round across the ski area too. Le Refuge is the oldest restaurant in Plagne Centre (and in La Plagne ski resort) and serves up delicious traditional French heritage and cuisine. Le Chaudron and Le Metairie offer cheesy French classics at reasonable prices. Gourmet lovers will not want to miss the ‘serious’ food at La Mine in Plagne 1800, with its elegant dining room and open fire or Le Petit Chaperon Rouge is another good choice here. If you’re in Belle Plagne and if you can get a table, Le Matafan is always packed thanks to its delicious French fare. It’s also advisable to book ahead at tiny Le Forperet restaurant, a “charmingly rustic” old refuge on the hill above Montalbert, or check out the cracking Friolin at the end of Les Crozats red run.